manila fashion observer: Anthology is Giving Away a Pair of Neons! Anthology is Giving Away a Pair of Neons! What's better than new shoes? Well, getting it for free of course! So listen up! 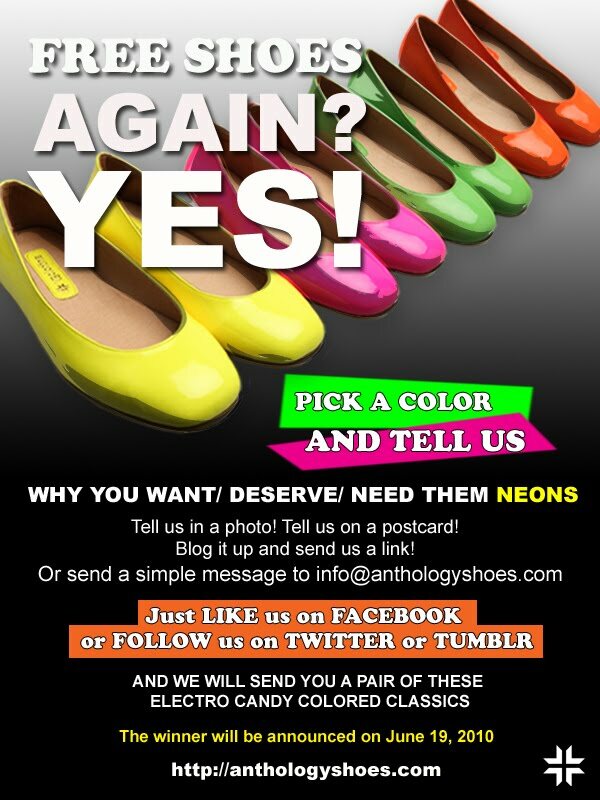 Anthology Shoes is giving away a pair of Anthology Neon Classics (in the color of choice) to one lucky girl. And it could be you! Just shout out the color you want (pink/yellow/green/orange) and share why you want/need/deserve a pair! And you can do it in so many ways! 1) You can post about it in your blog and post the link at the Anthology Blog. 3) Become a FAN on Facebook and leave a wall post! 4) Follow Anthology Shoes on Twitter and tweet it up! Get all creative and tell the folks at Anthology why they should give you one. Sky's the limit, do it online, in writing, via a photo, postcard or video, wherever you express yourself best! You've got until June 18, 2010! After that, there's 100% chance you'd need to cough up the dough to get your footsies new tootsies!